Please note: Features may vary depending on trigger model. You can find the exact trigger descriptions by clicking on the trigger models listed below. Please note: the red trigger housing may vary slightly from the product pictures, depending on particular product batch. Some may have the hole cutouts, while others do not. The total unit weight will remain the same. The AR-10 trigger is essentially the service trigger with a lighter pull weight range. Please note: You will still be getting an AR15 LPK when selecting this trigger model. 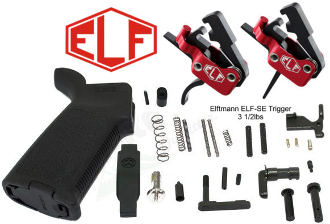 The ELF-SE Drop-In Trigger maintains the Elftmann reputation for quality, craftsmanship and customer service in an affordable package.